Does the Bible warn us of multiculturalism? Did you stop and wonder why we are living in such horrific times when every day we read about murder, terrorist attacks and unprecedented violence, well we were warned 2,600 years ago by Daniel the Prophet. Around 600 years before Christ, Daniel a prophet was asked to translate a dream the Babylonian King, Nebuchadnezzar had received from God. 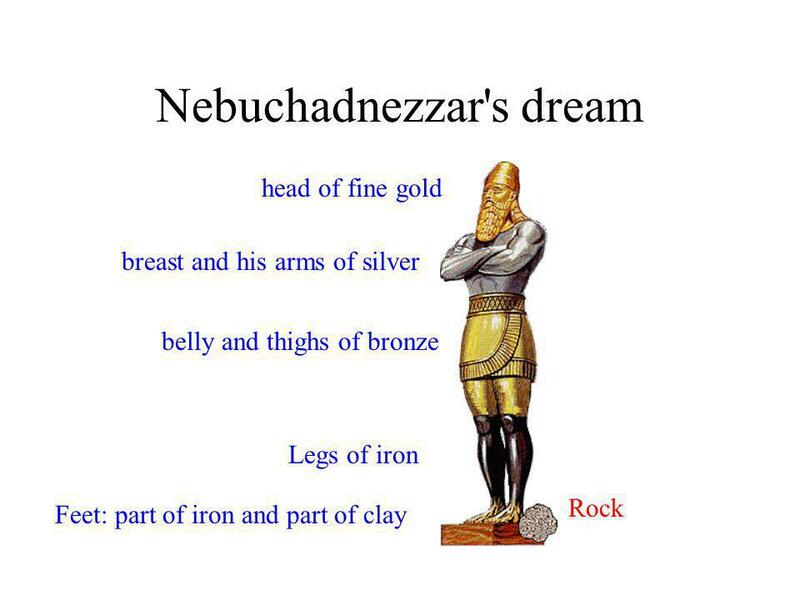 Nebuchadnezzar had dreamt of a frightening towering statue with a head of gold, a breast and arms of silver, belly and thighs of bronze, legs of iron, and feet of mixed iron and clay. The statue is destroyed by a rock that turned into a mountain filling the whole earth (Jehovah's Kingdom). Daniel explains the dream to the king: the statue symbolized five successive kingdoms...The golden head was King Nebuchadnezzar's Babylonian Empire. The silver breast and arms represented the Medio Persian Empire. The bronze belly and thighs were representing the Grecian Empire. The legs of iron was a representation of the Roman Empire. The feet mixed with iron and clay represents the current Anglo American Empire. Daniel goes on to write, Daniel. 2: 41 “And just as you saw the feet and the toes to be partly of clay of a potter and partly of iron, the kingdom will be divided, but some of the hardness of iron will be in it, just as you saw the iron mixed with soft clay. 42 And as the toes of the feet were partly of iron and partly of clay, so the kingdom will be partly strong and partly fragile. 43 Just as you saw iron mixed with soft clay, they will be mixed with the people; but they will not stick together, one to the other, just as iron does not mix with clay. The five empires are the five great empires of our times, the Anglo-American Empire is the last stage of the biggest empire ever, the British Empire, or Western civilisation which is now a multicultural mix of mainly Christian, Jewish or Islamic background which is a mix of iron and clay and is the weakest part of the last empire which will be destroyed on Jehovahs day.